Preheat oven or toaster oven to 400° F. Cut off pointed end of the garlic head to partially reveal cloves (do not peel or separate the cloves); place the garlic in the center of a small sheet of heavy-duty aluminum foil. Drizzle ½ teaspoon oil over garlic and sprinkle with a pinch of salt; wrap in foil. Bake at 400° for 45 minutes; cool 10 minutes. Squeeze to extract pulp; discard skins. 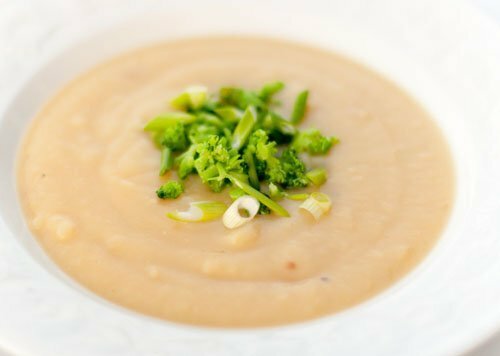 Pour potato mixture and garlic pulp into the bowl of a blender, and carefully blend in two batches until smooth and creamy. Or, use an immersion blender to blend the soup directly in the large pot. Stir in milk and the Parmesan cheese. Cook over medium heat, about 5 minutes or until thoroughly heated. Taste for seasonings, adding salt and pepper as desired.